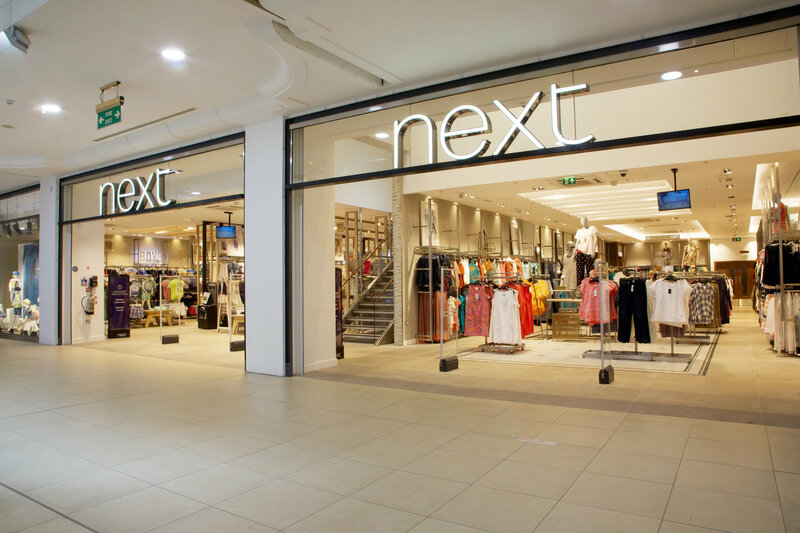 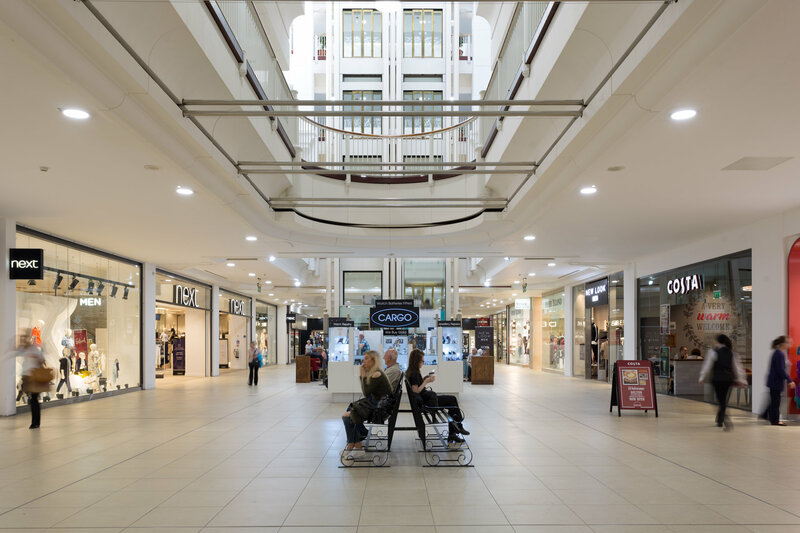 At the time our clients purchased the Shopping Centre, it could be defined in two quite separate entities. 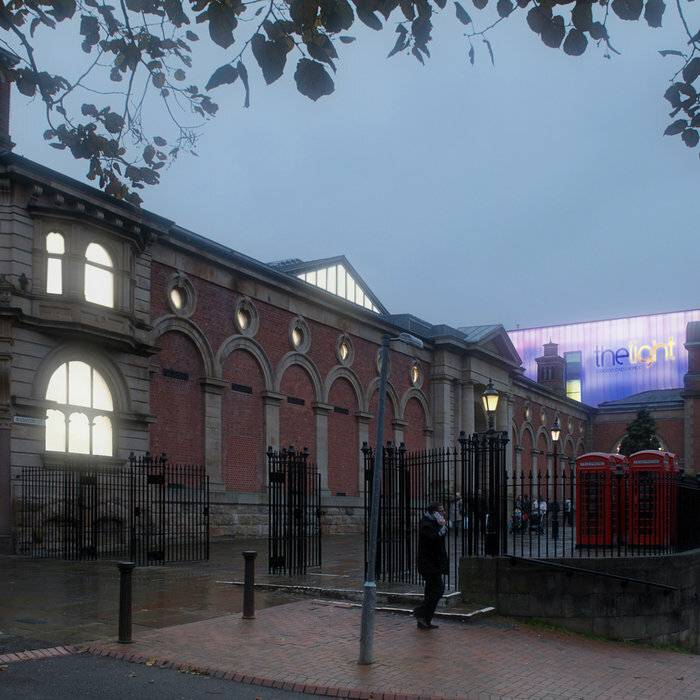 To the north the original 1980’s ‘Market Place’ shopping centre and on the south was the former ‘Market Hall’ dating from 1851. 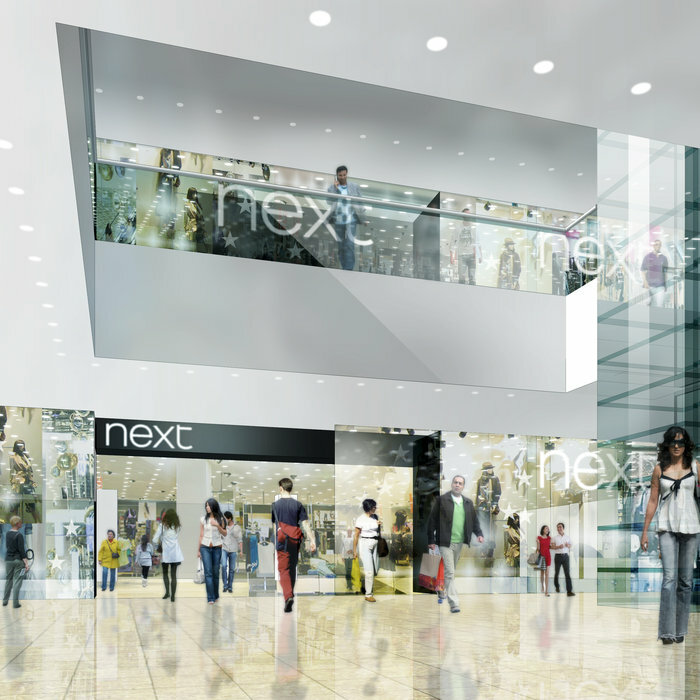 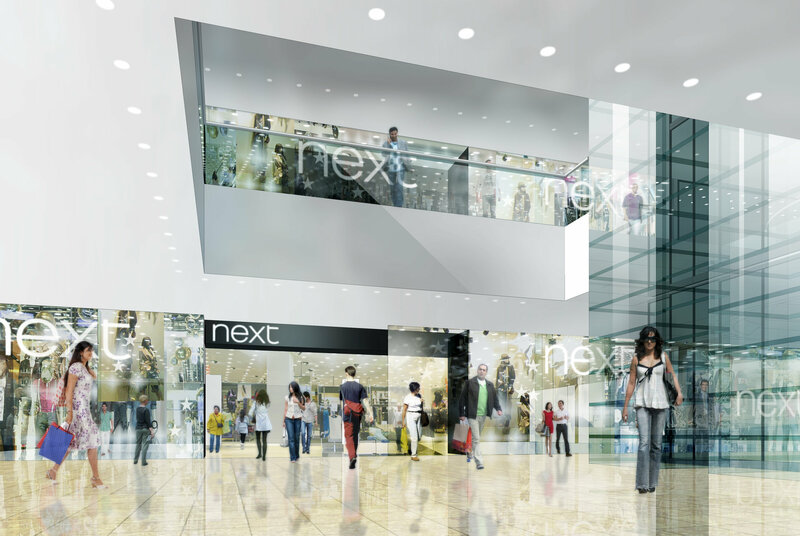 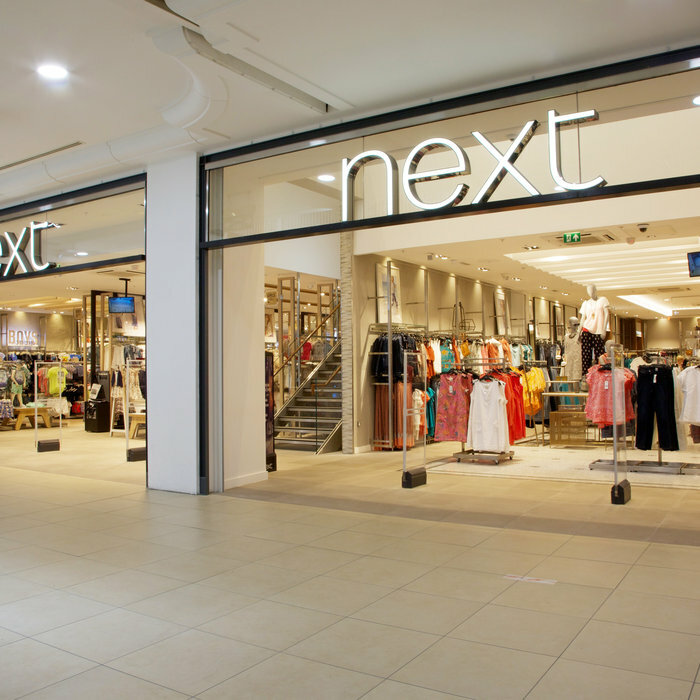 In terms of design and layout the north building was typical of the 1980’s – the shop units and frontages were no longer suitable for modern retail formats and the interior design was tired and outdated. 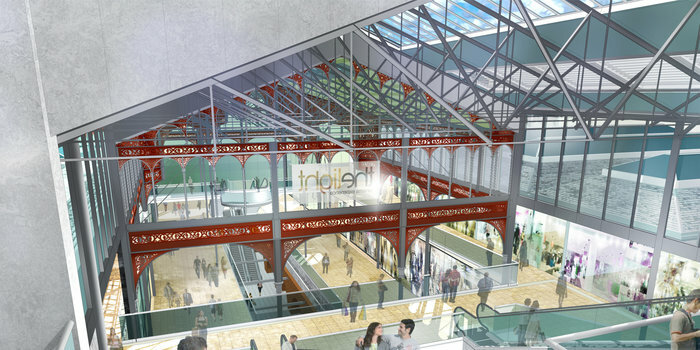 At the time of its construction, ‘Market Place’ was connected through a circular atrium structure to the Market Hall, then a functioning lively market. 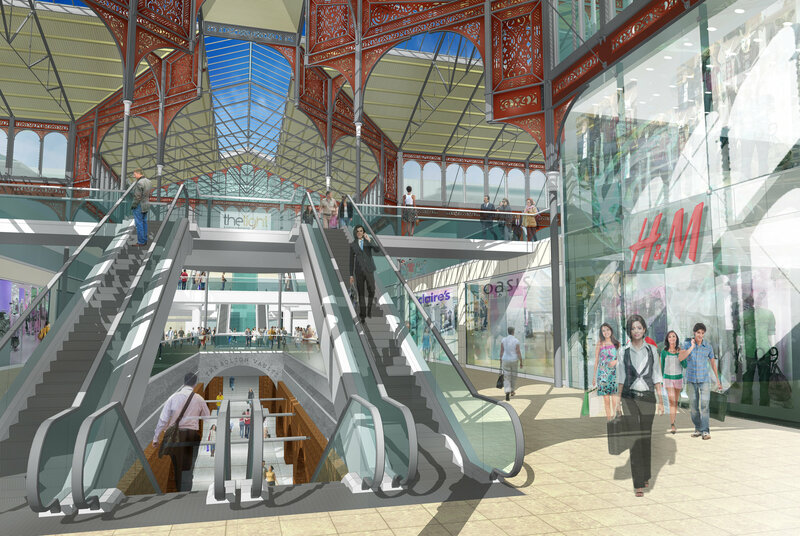 In the early 2000’s the market was moved out of the Market Hall and the shopping centre extended into the Market Hall over two levels with the 1980’s atrium both linking and dividing the two. 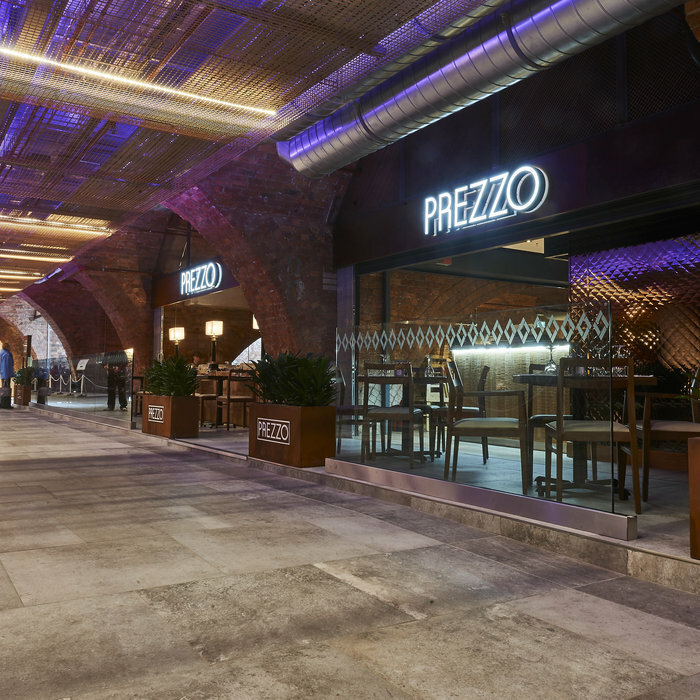 Our brief was to accommodate a 9 screen cinema and to create a new food and beverage quarter – together these were to create an evening destination in the heart of Bolton. 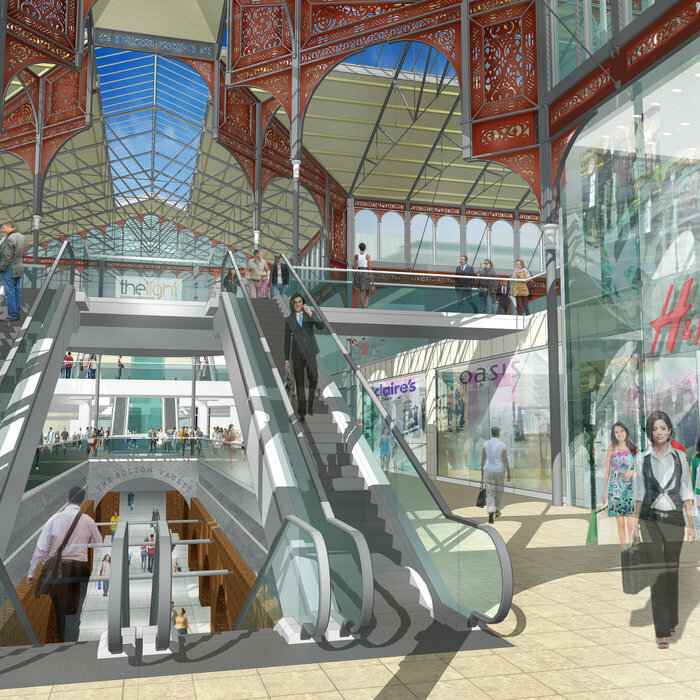 However, this design fault created the opportunity for the transformation of Market Place. 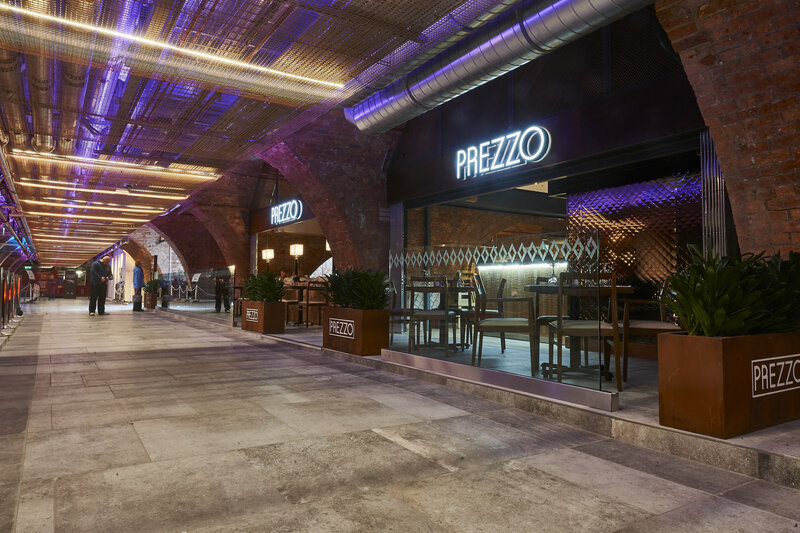 Lying underneath the Market Hall, forgotten by many of the residents of Bolton and neglected in the conversion 10 years ago lay the 19th century brick Vaults, built as storage for the market above. 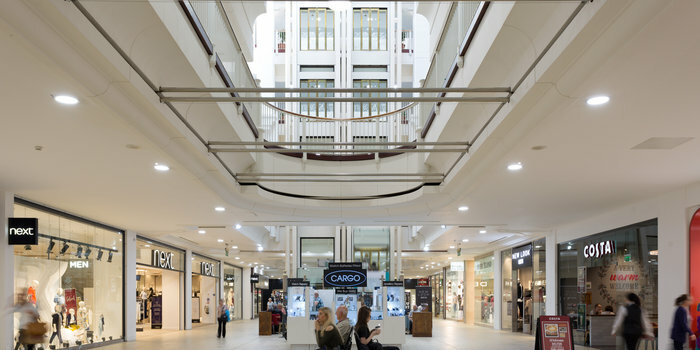 The width of the mall above allowed us to remove the central vault beneath whilst retaining 6m wide galleries to either side at ground floor. 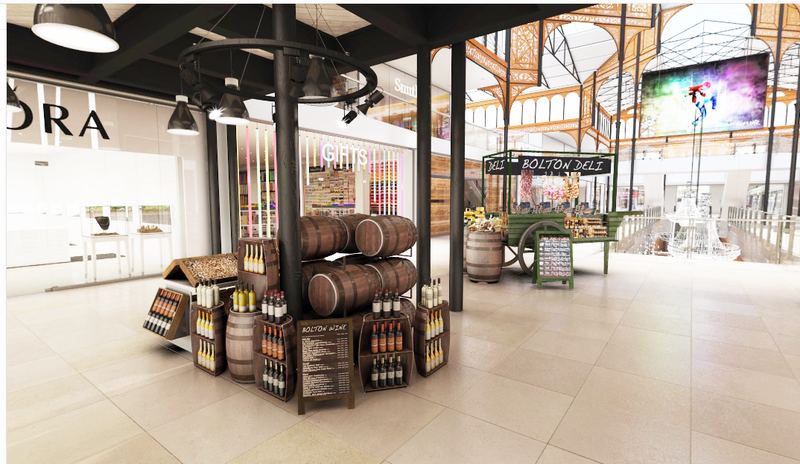 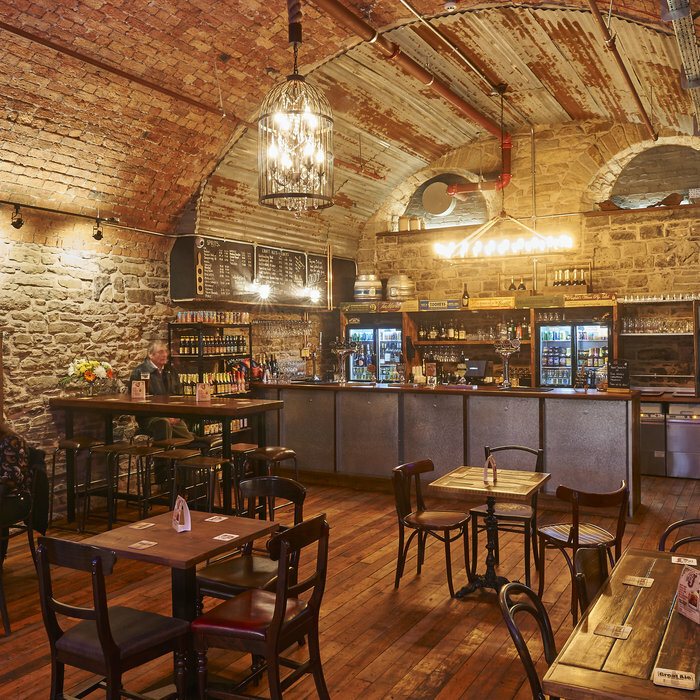 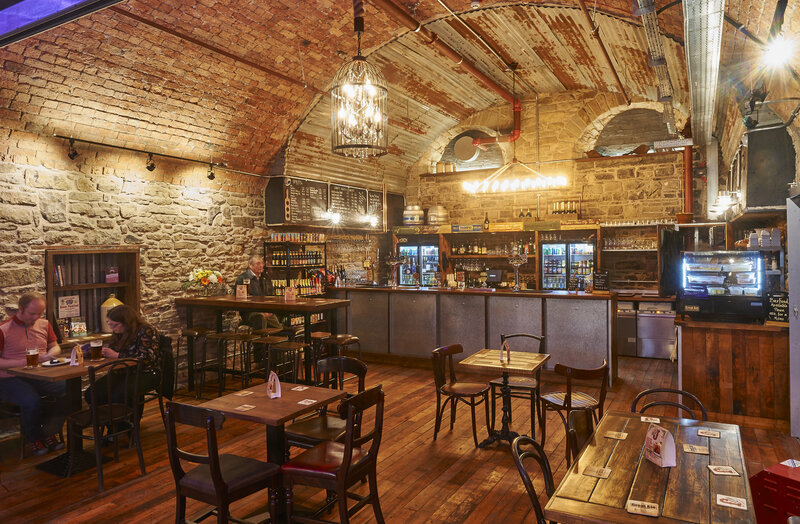 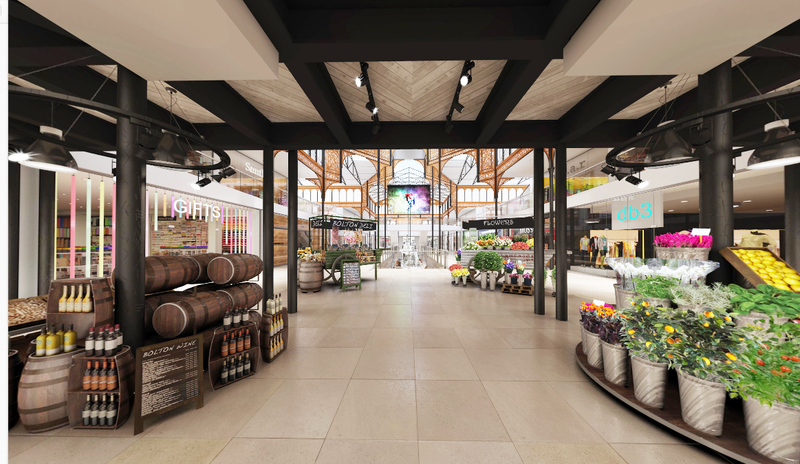 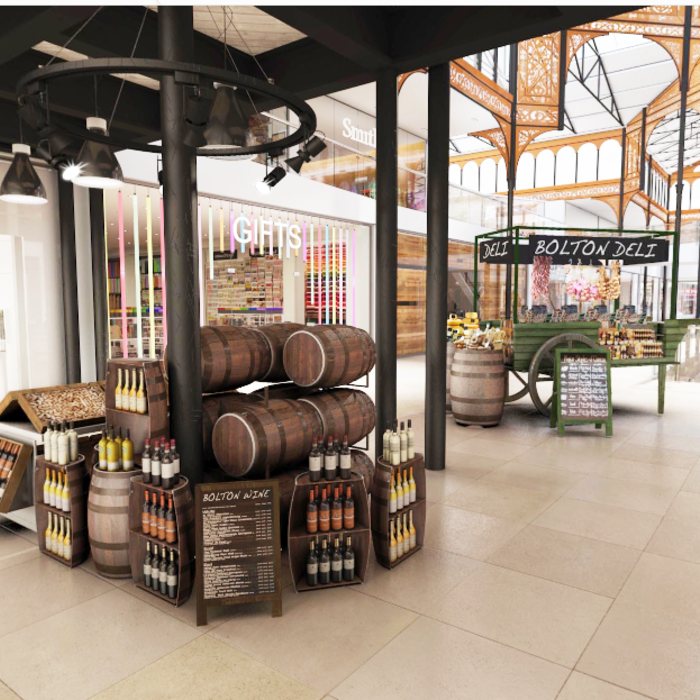 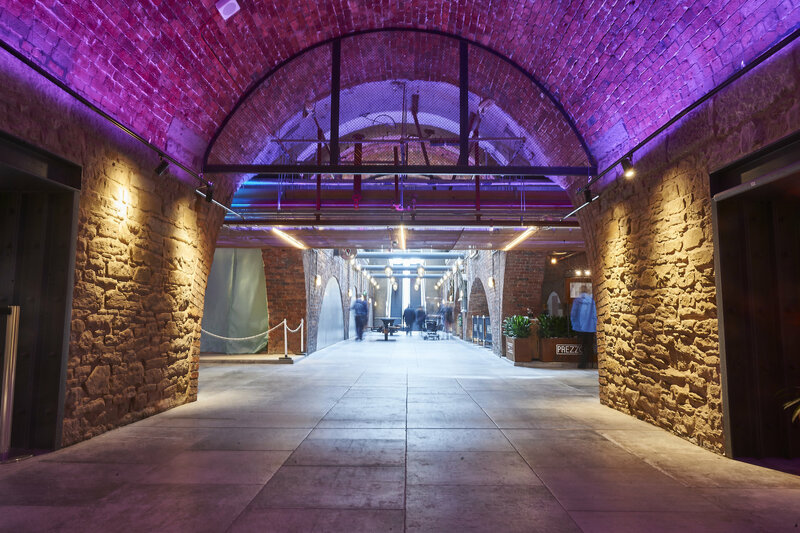 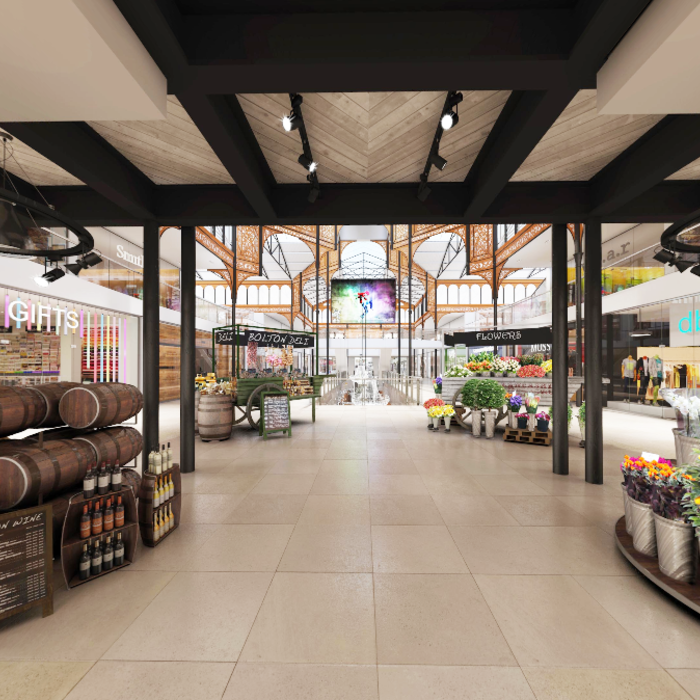 This ‘Cut’ has made the whole of the Vaults accessible to the Market Hall for the first time, creating a destination restaurants and cafes whilst also intensifying the potential for creating engaging and authentic experiences for shoppers and visitors. 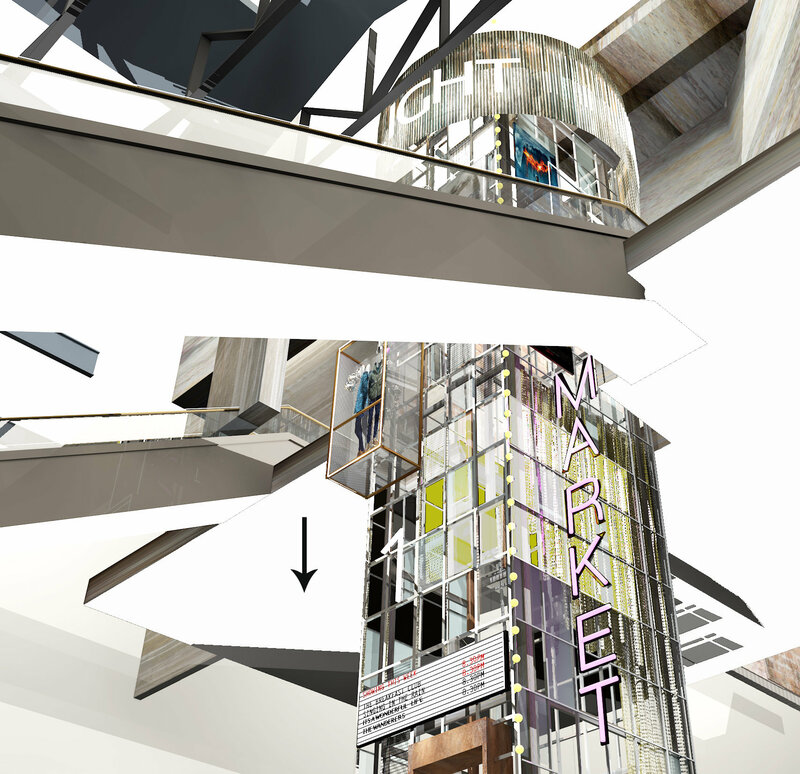 Circulation to the upper level was improved by turning the escalators around to suit the direction of arrivals from the south and creating a new link bridge. 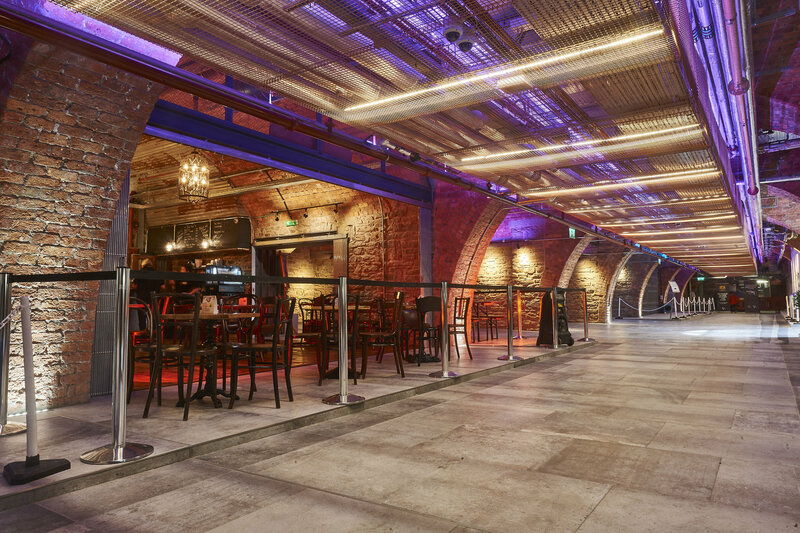 This bridge also incorporates a stage for performances. 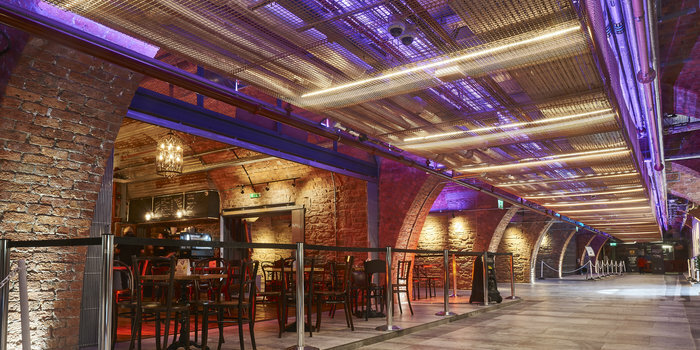 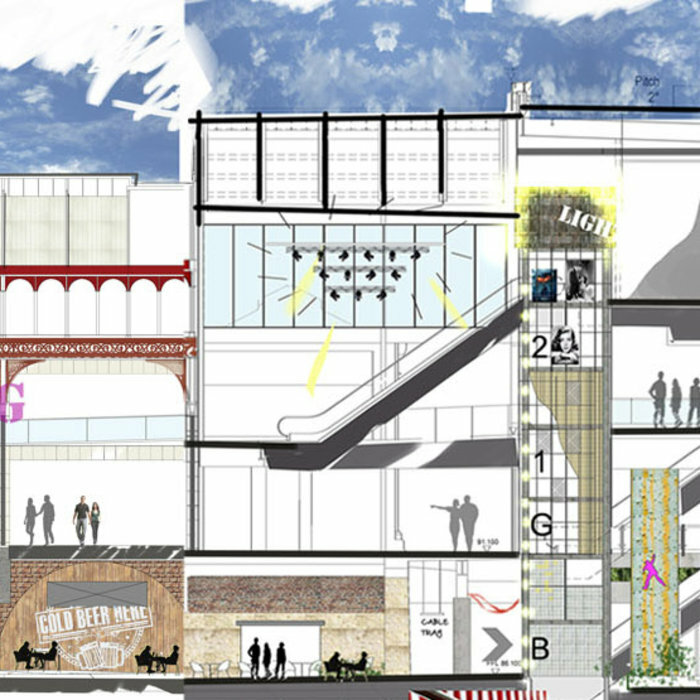 Also in the basement, spare capacity within the Loading Bay beneath the 1980’s building, adjacent the Vaults, was utilised to extend the restaurant and entertainment offer and to create a vertical link to the shopping centre and cinema above. 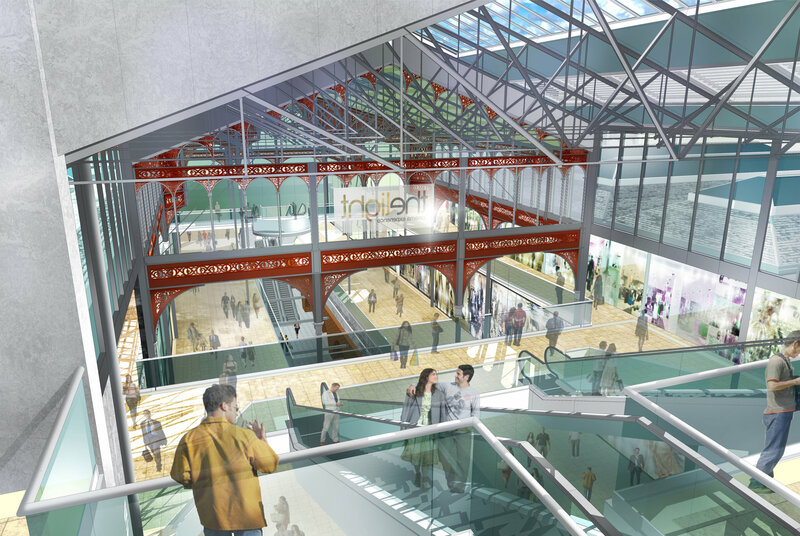 Finally the obstruction of the 1980’s atrium has been replaced by a simple volume of glass and steel that unites all four components of the building – the 1980’s shopping centre north, the Market Hall to the south, the Vaults beneath and the cinema above – in plan and section. 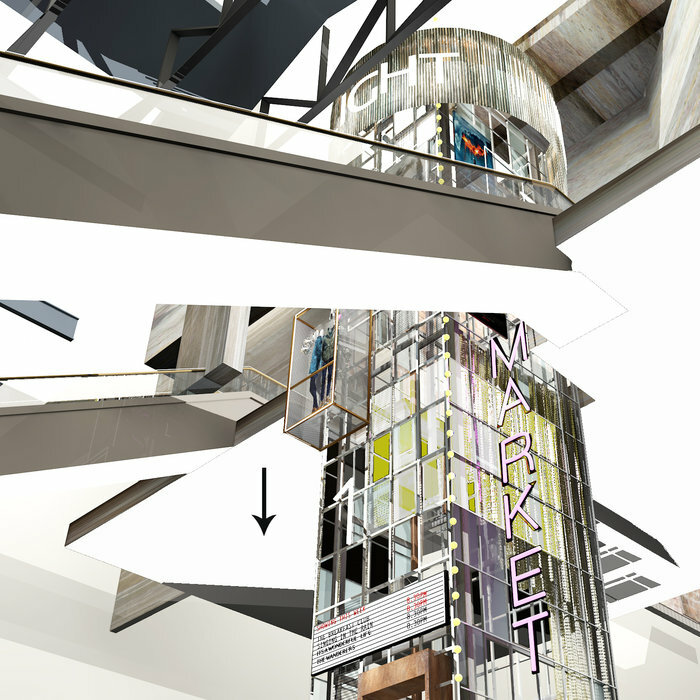 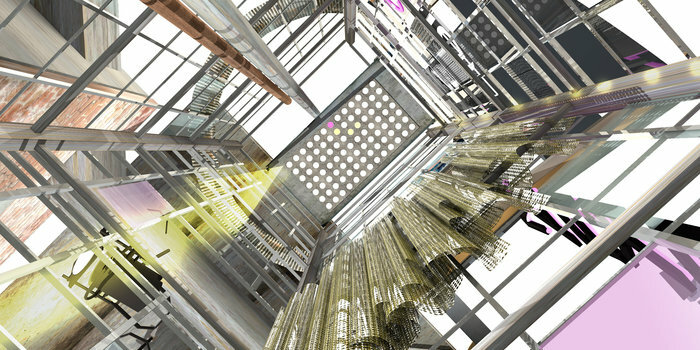 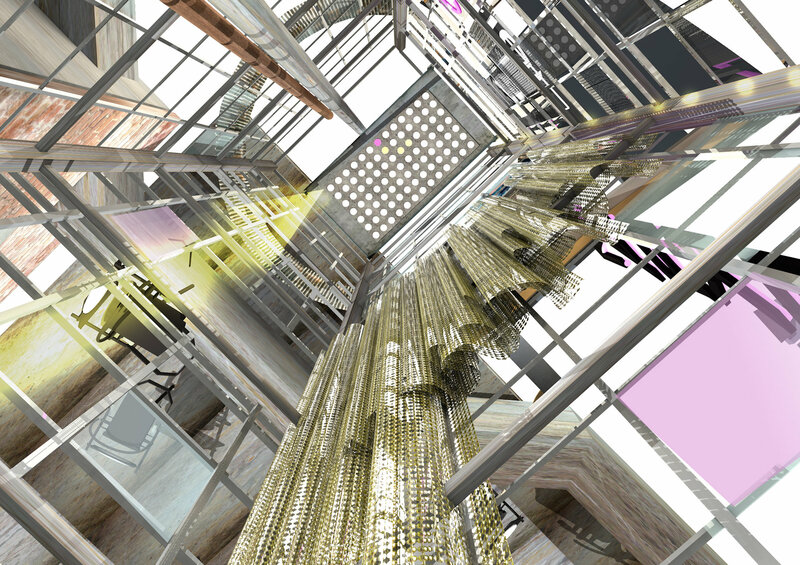 New escalators and lift link every level whilst views are opened up between the main entrance up to the cinema foyer, through to the north Mall and down to the Vaults. 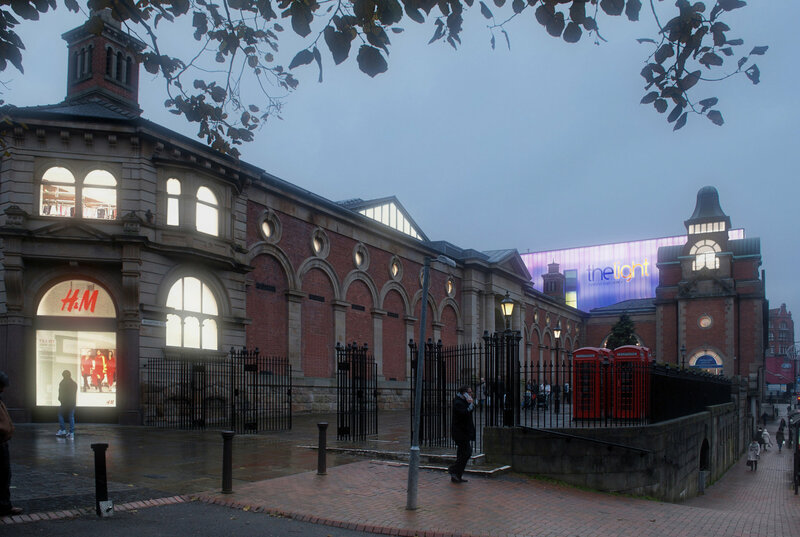 Throughout the process the design team has worked closely with the Planning Department, Conservation Officer and Historic England to ensure that the proposals were designed and developed in the best interests of the historic building whilst accommodating new commercial uses. 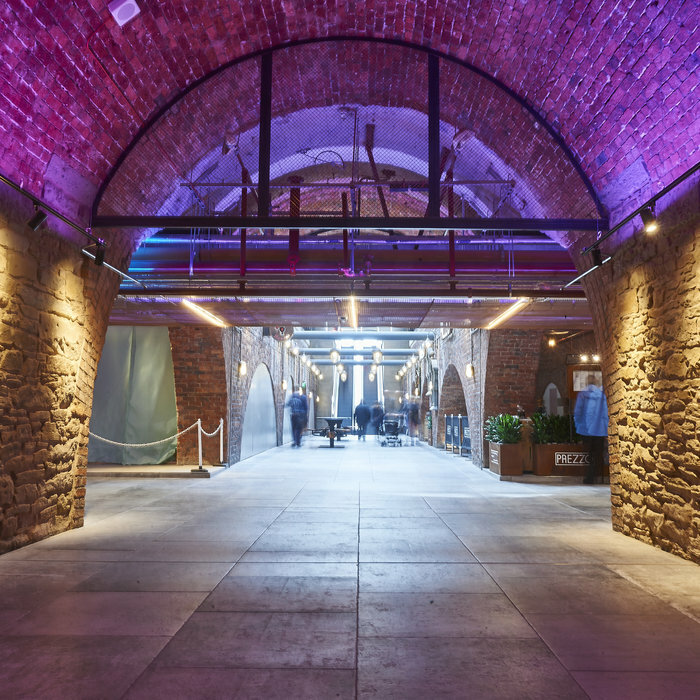 breathing new life into the building, re-establishing Bolton Town Centre as a destination of choice and opening up an important piece of Bolton’s heritage to the citizens of the town for the first time.